Your trek along the Katy Trail continues into Central Missouri and passes north of Jefferson City, Missouri’s capital city. 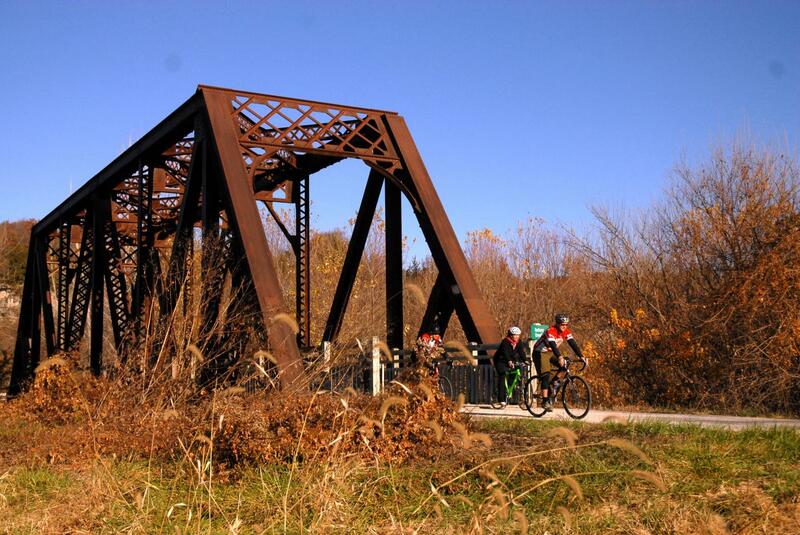 Hop off the trail for side trip to Jefferson City via the access route that leads to the pedestrian/bicycle bridge that is attached to the Missouri River Bridge. The bridge offers an exciting vantage point from which to view the Capitol and the river valley. One of the first things you need to do in Jefferson City is establish a home base. If you want to stay downtown, the Doubletree Hotel and the Capitol Plaza Hotel are popular choices. Both offer on-site dining options and have extra amenities, such as swimming pools and fitness rooms, just in case you’re not worn out from a day on your bicycle. These properties are both within two blocks of downtown shops, restaurants and attractions and provide quick access back to the trail when you’re ready to depart. Now it’s time to start your visit at one of the most beautiful state capitols in the country. Stretching 238 feet above ground level, Missouri’s Capitol is a stunning piece of architecture, complete with 48-foot columns on the south portico and several outdoor sculptures. Take a guided tour or simply walk in and around the Capitol at your own pace to see exhibits inside the Missouri History Museum and to admire various works of art, including Thomas Hart Benton’s famous Social History of Missouri mural. Within two blocks of the Capitol you find the Missouri Governor’s Mansion, the Missouri Supreme Court Building and the Jefferson Landing State Historic Site, all of which are open for tours (hours vary) and offer a unique slice of Missouri history. Two more things you really need to add to your must-see list: The Missouri State Penitentiary and Central Dairy. Prepare to be blown away by both, but for totally different reasons. The Missouri State Penitentiary was taking prisoners 100 years before Alcatraz opened. 100 years! History tours offer insights on famous inmates and occurrences at the prison, which has hosted numerous paranormal investigations, including those featured on popular TV shows such as Travel Channel’s Ghost Adventures. Tours sell out far in advance, so reservations are a must. Central Dairy is an institution in Jefferson City. On hot summer days, expect to see lots of like-minded folks looking for a cone, banana split (you probably can’t eat one all by yourself) or sundae at Central Dairy. You’ll see the place packed on cold days, warm days and days ending in the letter Y. For a more substantive meal, check out popular Jefferson City eateries such as Arris’ Pizza, Madison’s Café, Paddy Malone’s, Prison Brews and the Grand Café. Throughout the year, Jefferson City hosts a variety of fun and family friendly events. Oh, if you need bicycle equipment or repair work, Red Wheel Bicycle Shop is located just less than a block west of the Capitol.